As we have recently moved into a new apartment, I wanted to avoid the use of 20 litre water containers which need refilling and involve both a recurring cost and an excess of transport for us to have access to clean drinking water. Having been impressed with Warren’s “Tunsai” water filter I decided to get one of my own. The water-filter works by using a ceramic water purifier which removes sediment and 99.99% of bacteria. Whilst the primary market for these filters is families that do not have access to clean water, that use charcoal and wood for boiling water, and rural merchants and households – it still makes sense to me that we should use them as well for both health and environmental reasons. How do I buy this water filter? At first I drove around Phnom Penh on my bike trying to find a shop that had Super Tunsai in stock but I couldn’t find one anywhere. Then I looked online and found the Hydrologic website, looked at the IDE website and neither of these seemed to have any clear information about where to actually buy the Super Tunsai water purifier (as a web developer this inability to give useful information was quite frustrating). Warren suggested I email Cordell who works in sanitation in south-east Asia. Cordell put me in touch with Rachel Pringle in IDE Cambodia and Rachel very quickly and courteously provided a delivery hotline. Call this number and they will take your address and deliver straight to your door. The cost of the filter is $28.50. Why this number isn’t listed online anywhere that I can see baffles me! 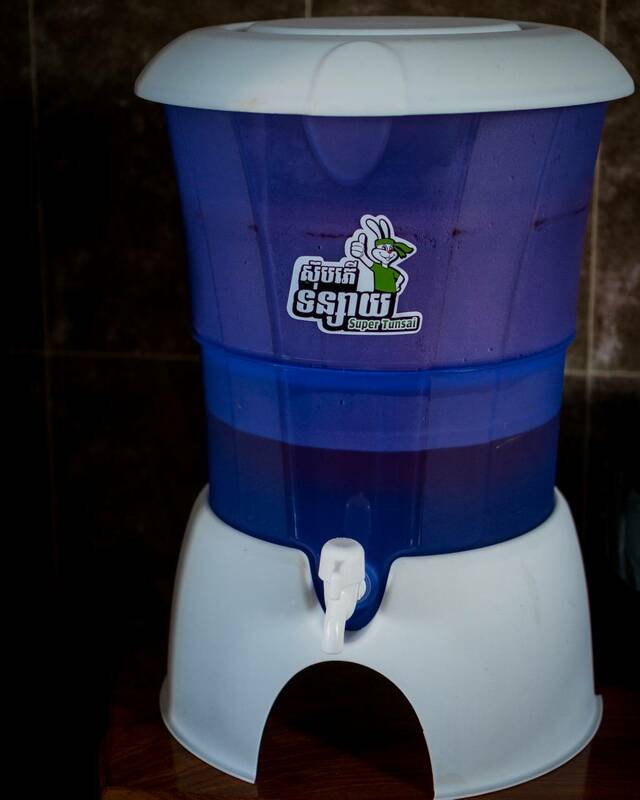 If you’re interested to see how Hydrologic make this Cambodian product, check out the video below. We’re delighted to have our very own water purifier and can now have clean and pure drinking water without waste plastic, boiled water, or recurring water deliveries.